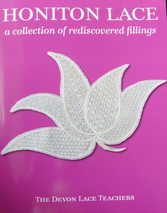 Published by the Devon Lace Teachers based on the work of Christine Hawken. Click for more details and to access the contact page for this book. Honiton Lace, a collection of rediscovered fillings. Based on the work of Christine Hawken. Devon Trolly Lace Patterns and Lace for Queen Victoria. Click to contact us regarding any queries you have about this book.